Come summers and we all wait for the king of fruits, mangoes to arrive. I remember as a kid we used to have mango eating races at my maternal uncle’s home and aamras used to be the summer lunch staple. My mom used to make all sorts of pickles, preserves, shakes, icecreams from raw and ripe mangoes and we continue the tradition till date. And then came the year 2000 and suddenly everyone became aware of the calories, free sugar and carbohydrates they were consuming and how it was making them gain weight. White rice, maida , white bread, pasta, noodles, icecream – everything became a villain. These were (and still are) the foods to be strictly avoided if you wanted to lose weight or are diabetic. But somehow, even mangoes began to be clubbed into this ‘evil food’ category. In retrospect, I think it was the general belief that whatever is really tasty has to be bad for you- and mangoes definitely score on the tasty front. Come to think of it, even gym instructors; weight loss centres etc. warn you against eating mangoes in the summers. So could there be some basis to this belief that eating mangoes will make you fat?? A mango is loaded with nutrients and is quite low in calories. One mango (~200 g) has fewer calories than one paratha or two slices of bread. It has a small amount of protein and virtually no fat. This fruit is packed with vitamin C providing up to 80% of your daily requirement which means more disease fighting capacity for your body. Beta-carotene and Lycopene are the other two vitamin precursors loaded in a mango, leading to better skin, hair, eyes, nails and more protection against cancers of various types. To top it all, the high amount of fibre (and medium glycemic index) in a mango means you will keep feeling fuller for a longer time, leading to less cravings to eat other foods and also a healthier lipid profile and a well tuned digestive system. If such are the virtues of this fruit then why does it continue to be dreaded by dieters and health conscious folks? That’s because in our country we consume large amounts of mango after adding something to it. How is aamras made (in most households)- by adding sugar, milk, cream to mango pulp/juice and then just before serving , in goes a dollop of ghee. A milkshake has added sugar and full cream milk, jams and preserves have tons of sugar and so do the mango drinks. A mango icecream, well, less said the better. The readymade aamras, icecream, fruit drinks, jams, fruit drink powders are loaded with corn syrup, fructose powders and preservatives – all of which are known to cause weight gain and raised blood glucose. But we have only homemade aamras without adding any sugar or ghee to it, you say? Then tell me, how many chapatis or puris (deep fried, high calorie) do you have with it? Four, five, I don’t know how many. That’s the other reason- you can eat even five mangoes per day if you want to, but you cannot discount the calories that the mangoes are giving you. 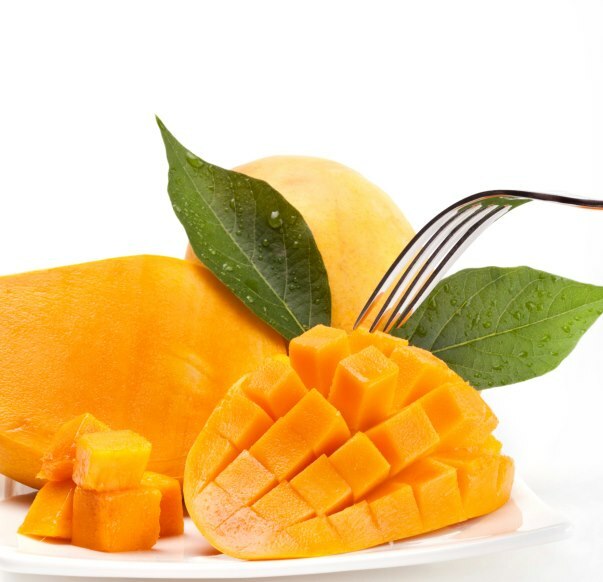 The mangoes you eat should substitute another carbohydrate rich item in your daily food. For eg. Skip the bread in your breakfast and eat a mango or have only one chapati (instead of three) and two bowls of no sugar added aamras. The third most important reason for the weight gain in summers is the fact that summers mean vacation time for most people. So everyone is in a relaxed mood, you have parties and dinners happening, you travel to the latest favorite holiday destination and eat and drink good food there, forget exercise and indulge in back to back movies with pizza and soft drink/beer combos. If such is the lifestyle, you don’t even need the excuse of the ‘evil mango’ to gain weight. Then why blame the fruit? The next time anyone says mangoes make you fat, tell them to carefully analyze their summer lifestyle and find out the real cause of the weight gain. This entry was posted in Diet and Nutrition- Simplified and tagged beta carotene, calories in a mango, do mangoes make you fat, does mango make you fat, king of fruits, mango, mango and health benefits, mango fat. Bookmark the permalink. 1 Response to Mangoes will make you Fat. NOT.